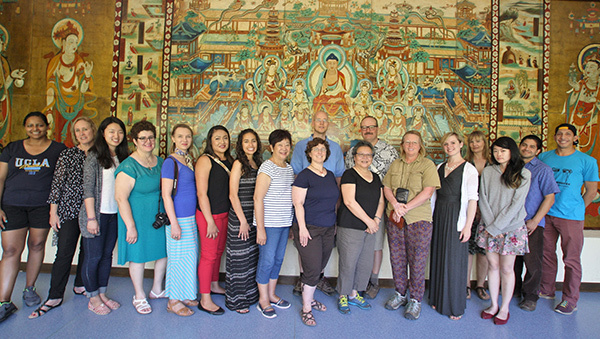 This summer I accompanied twelve California middle and high school teachers on a visit to the cave temples of Dunhuang as part of the 2015 Summer Institute on China. 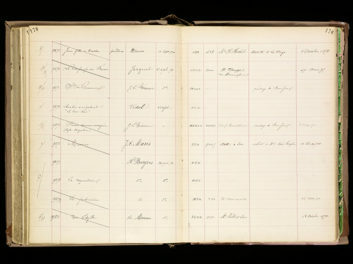 I’m the administrator of the program, which is sponsored by the UC Berkeley Institute of East Asian Studies, the UCLA Confucius Institute, the San Mateo County Office of Education, and Shanghai Jiao Tong University. Since 2007 this unique program has been open by application to all California middle and high school teachers from any discipline. It offers an intensive three-week program that combines lectures by university faculty and cultural experts, discussions, instructional strategy planning, curriculum development, an introduction to the Chinese language, and the opportunity to explore China firsthand. The 2015 Summer Institute brought our group of 12 teachers to China to soak up cultural experiences they could bring back to the classroom. Before leaving California, we participated in a daylong workshop at the Getty Conservation Institute and the Getty Research Institute to learn about the art of the cave temples (Mogao grottoes) of Dunhuang, the history of the murals and manuscripts found there, and the conservation work being done at the caves, which will be the focus of a major exhibition at the Getty Center, Cave Temples of Dunhuang: Buddhist Art on China’s Silk Road, from May 7 to September 4, 2016. The workshop piqued our interest in the caves—we were all full of excitement to see them in person! After traveling together for two weeks through Shanghai, Suzhou, and Xi’an, we thought we would be ready for Dunhuang. With a population of 180,000, Dunhuang is very different from the big cities in China, which boast populations 5 to 20 million each. 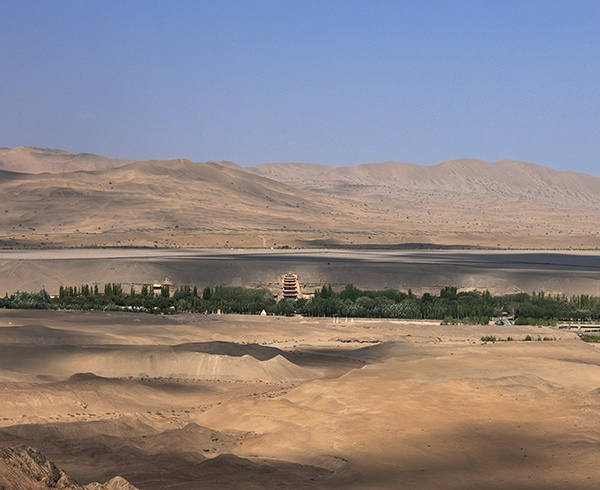 The landscape surrounding this oasis is barren, with sand dunes rising in rows before snow-topped mountains far to the east. The pagoda structure outside Cave 96—which houses a colossal Tang dynasty Buddha statue some thirty-three meters high—was visible from two miles down the road. 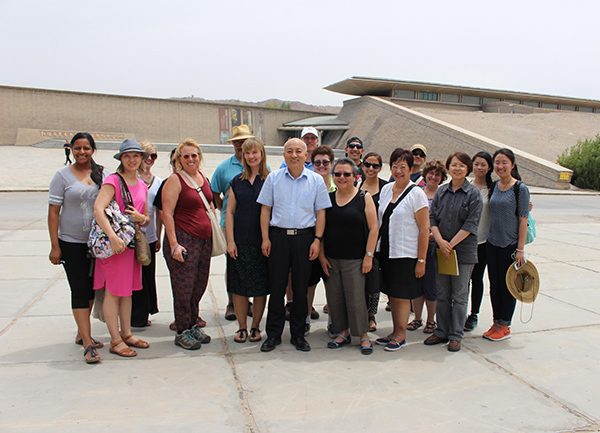 “Magical” was the term several teachers used to describe their first experience with the cave temples in Dunhuang. The darkness, chilly air, smell of the clay, and sense of history could be felt as soon as we crossed the threshold of the first cave. 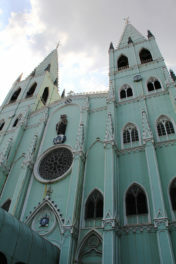 We stepped from the present into the past and were awed by being in a place that people made sacred thousands of years ago. Mogao Cave murals illustrate stories that have cultural, religious, and historical significance. The themes seemed universal, as applicable to us today as they were to people at the time they were painted centuries ago. We also enjoyed the Visitor Center, which is shaped like the dunes, with low, flowing lines and a color of dark sand. If you didn’t know it was there, you’d pass it right by. Two featured videos were exciting and engaging. The first film gave a visual history of Dunhuang, and the second 360° movie screen showed the scope and details of some of the cave art. Later we walked through replica caves in the on-site museum, and were impressed by the size and degree of detail. 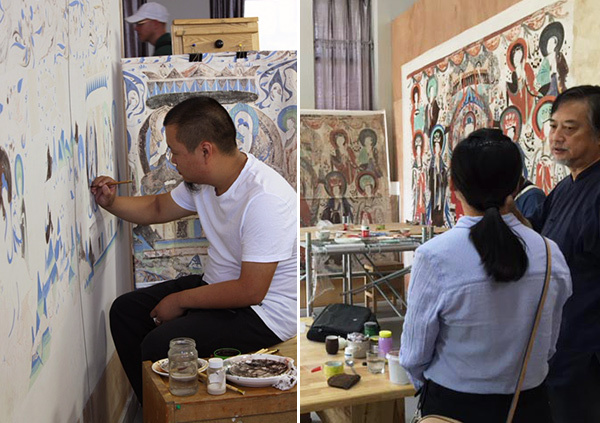 Hou Li Ming, the director of the Art Institute of Dunhuang Academy, walked us through the artists’ studio, where artists are working on a replica of Cave 285 that will travel to the Getty in 2016 for the exhibition. We learned it would take ten artists three years to replicate the cave. Seeing the replication process gave us an appreciation of the artistry, craftsmanship, and detailed planning that went into the creation of the actual caves—and that is continuing at the Dunhuang Academy as their artisans prepare to bring the Mogao Caves to the world outside China. It was obvious from all the people we met: the Chinese take tremendous pride in this world heritage site. The artists spoke of being part of something bigger than themselves. After spending time in the cave temples of Dunhuang, we share that sentiment as teachers and hope that our lesson plans develop a bridge for the next generation of learners. In the summer of 2016, during the run of the exhibition, the J. Paul Getty Museum’s Education Department, in collaboration with the Getty Conservation Institute and the Summer Institute on China, will be offering a one-day secondary teacher workshop at the Getty Center. 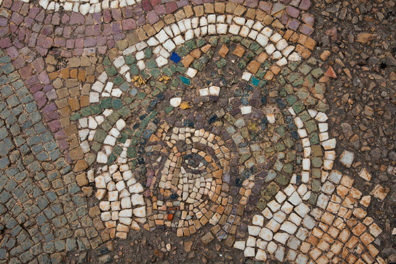 Interested educators can sign up for Getty Teacher Update, a free e-mail newsletter for K-12 teachers sent four times per year with information on resources and opportunities at the Getty Center, the Getty Villa, and online at getty.edu. Text of this post © Karen Leong Clancy. All rights reserved. I'm an educator, the administrator of the Summer Institute on China, and vice president of the Alumni Associations of the University of California.